The London Foot and Ankle Centre has a dedicated Heel Pain Clinic for the rapid assessment and effective treatment of heel pain or plantar fasciitis. One in ten people will experience heel pain and for many, the problem will have a very significant impact upon their lives. The treatment for plantar fasciitis Heel Pain Clinic has been established to provide a comprehensive service, offering the full range of advanced treatment options for people with long term, intractable heel pain. At our dedicated clinic, you can normally have your assessment, x-rays, opinion and first treatment all during your first visit. There are two main types of heel pain, occurring in different places. A small number of people will have pain in both areas of the heel. The ‘grumbling’ Achilles is known medically as non-insertional Achilles tendinopathy. Although a rupture of the Achilles is well known, it is actually more common to have what is known as a grumbling Achilles. The pain is felt at the back of the heel above where the Achilles tendon joins the bone. It feels stiff and swollen, particularly in the morning and can prevent the sufferer from taking part in sport. Sometimes the pain is lower down where the tendon joins the bone. This Insertional Achilles tendinopathy is less common. Policeman’s heel is known medically as plantar fasciitis because it occurs in a tendon called the fascia. The fascia is a strong band of tissue stretching from your heel to your toe bones. It supports the arch of your foot and acts as a shock absorber in the foot. Pain is felt at the bottom of the heel where it connects with the ground in each step. Pain and stiffness often leaves patients “hobbling” for the first few minutes in the morning. The pain can be severe, especially after standing for a long time. Plantar fasciitis is very common indeed and one of the main reasons for seeing a foot specialist. How do we assess the best treatment for each patient? 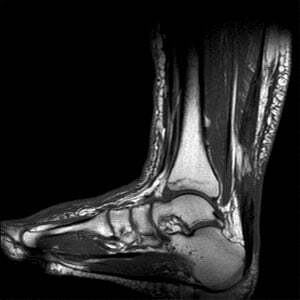 Our consultant orthopaedic foot and ankle surgeons will carry out a full examination of your foot. This is combined with an ultrasound scan, undertaken and assessed on the same day as your initial visit to the clinic. If for example the examination shows the calf is extremely tight, we will recommend surgical calf stretching because injections or shockwave therapy will not work. We use specialist ultrasound called a Doppler scan which provides a very detailed image of blood flow in the affected area. For some patients, the scan shows a process known medically as neovascularity. The surgeon can see there are too many small vessels feeding the tendon, perpetuating the swelling and pain. Small nerves follow the vessels. If this is the case, injections are helpful. The first line of treatment for heel pain should always be calf stretching exercises. You should be seen by a physiotherapist who will demonstrate exactly how to do calf stretching exercises correctly. Footwear modifications can also be very helpful – simple heel cushions relieve pressure from the painful part of your heel. We recommend that you try first line treatment for two to three months before moving on to further treatment. Eight to nine out of ten patients with heel pain find the pain eases with stretching exercises. If shockwave therapy is indicated as the best treatment for your heel pain, you will have your first session during your initial visit to the Heel Pain Clinic. Each session takes approximately 3–5 minutes. You will lie on your front while the shockwave is applied with a machine rather like a small pneumatic press. Patients experience some discomfort during the procedure and there may be a little redness on the skin after treatment. Exceptionally, the heel pain becomes slightly worse after treatment before getting better. A total of three sessions are needed, with no more than one to two weeks between each session. We use the latest shockwave therapy machine, called the Swiss Dolar Clast. This is more effective than older machines which focused energy on a limited area, or ‘pin-head’. The new technology works by emitting the energy like the ripples from throwing a stone into water. How does shockwave therapy for heel pain work? Shockwaves cause micro damage to tissue in the affected area and in so doing, stimulate healing. Nature gets a second chance. The treatment has a directeffect on the nerve endings which make them less sensitive and therefore less likely to transmit pain. The benefit of shockwave therapy for heel pain is often not felt until after the third session. The treatment works well for 80 per cent of patients. The effect of the treatment is usually permanent and there is no need to return for further sessions at a later date. What evidence is there that shockwave therapy for heel pain works? LFAC Consultant Orthopaedic Surgeon Mr Matthew Solan and Consultant Radiologist Dr Andrew Carne are among a small number of UK specialists to be trained by ATRAD. This is an international Association for Radial Pain Therapy, which is at the forefront of training, researching and developing technology in this field. Mr Solan and Dr Carne adhere to NICE guidance and also are registered with ASSERT, a data collection study for Shockwave treatment. They have both published research on their work and results. Surgical calf stretching, known medically as Gastrocnemius Release is an established procedure, further developed by Consultant Orthopaedic Surgeon Matthew Solan for the treatment of heel pain. It is carried out as a day procedure and is minimally invasive, using a very small incision behind the knee. Injections are particularly helpful for people with neovascularity, when the Doppler scan shows there is a large number of small veins feeding a swollen tendon and perpetuating the pain. A course of three injections is normally given, with several weeks between each injection. Injections are undertaken with ultrasound guidance to ensure the injection reaches the target area. Please call us or email us to arrange an appointment today. While we endeavour to answer all email enquiries as soon as possible, we encourage patients to telephone us should they require an immediate response. To refer a patient for an appointment with any of our Consultants, please complete the online Patient Referral Form.